Home › Blog Entries › Get out of the Boat? Are you Crazy?! Get out of the Boat? Are you Crazy?! In Matthew 14:22-33 we can find the story of Jesus walking on water, and the subsequent account of Peter stepping out of the boat with his own attempt at water walking. Upon reading this it is very easy to slip into “Sunday School” mode and go straight to the faithfulness of Peter. But for a moment, let’s step out of our typical approach to this passage and simply be honest and open with one another. Based on every worldly scale, we would place Peter’s actions all the way over on the crazy side of the scale. He steps out of a perfectly good boat to attempt to walk on the surface of the water. Not smooth, sold, winter-frozen, drive your car onto the lake to go ice-fishing water, but the rolling, wind tossed, heaving water of a stormy lake. Peter is the only one that sees Jesus out on the water, and says to himself, “You know, I think I should go out on the water also.” The other disciples seem to be acting far more level-headed by staying in the (relatively) safe boat. In fact, I imagine that most of the disciples at that point would have much rather been on dry land, rather than in the wind-driven boat, let alone trying to walk on top of the chaotic waters in the dark. Staying in the boat seems to be the far more sane option. More sensible. The right thing to do. The best option, and quite simply the only option. But Peter is not what you would call a “by the book” kind of guy. Read the gospels and you will find that Peter is what some might call impetuous. It certainly seems that way here. On the surface it is really easy to sit back and sort of shake our heads at Peter, saying, “Poor Peter. So rash and quick to jump. He needs to think about what he does first.” Much in the same way that I imagine the other disciples thinking. It’s at this point that the “Sunday School” mindset can no longer be restrained, because we know that Peter is going out onto the water to see Jesus. That Jesus has invited Peter onto the water. We don’t have to make logical sense of Peter’s actions, because he is clearly responding to Jesus. With the full understanding of the story we also can understand that Peter is being faithful to step out into the unknown and uncertain. The presence of Jesus’ call trumps rational thinking, it drowns out logic, and dare we say makes crazy things sane. 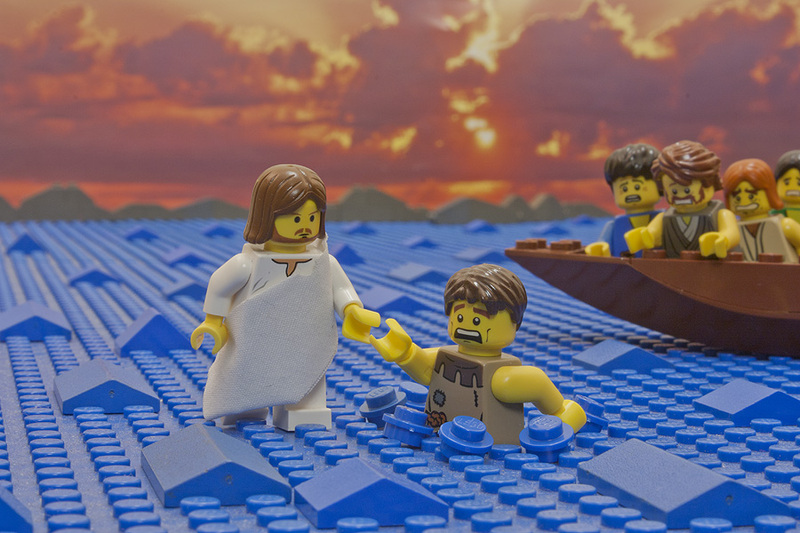 In looking at this story we are confronted by Christ, inviting His faithful disciple, to join Him on the storm swept sea, and if we can just for a moment capture even a tiny piece of Peter’s faith that evening, we will not be the same. Peter’s faith may have been small according to Jesus, but Peter stepped out of the boat. May we also step out of comfortable places to stride upon the uncertain waters in response to the call of Christ. Ash Wednesday and Lent: Empty Tradition or Full Opportunity? J. David Tate on Ash Wednesday and Lent: Empty Tradition or Full Opportunity? Mike on Ash Wednesday and Lent: Empty Tradition or Full Opportunity?